Swimming can be one of life's greatest joys- an amazing low-impact, highly-effective form of exercise that's fun to do. It's also a valuable skill that can save lives in an emergency or one that simply helps facilitate fun. But swimming isn't just something people should learn- our pets, too, deserve the belabored benefits of swimming. Pet owners with pools should be particularly interested in teaching their pets to swim, as it is a matter of safety. Dogs and rambunctious cats may fall into the pool while chasing a toy, playing on the pool deck, or attempting to learn to swim on their own. We hope that this guide can prove useful in teaching your pet how to swim and helping you keep your pet safe this summer. There are a number of things to prepare before embarking on this educational endeavor with your pets. It's important that your pool is well-maintained to ensure that it is safe for your pet. Your pool should be a comfortable temperature for a leisurely swim, which can be anywhere from 84°F to 94°F, depending on the preferences of your pet. Although your pet may differ, typically, younger pets and cats prefer temperatures on the warmer end of that spectrum. It's also important to ensure that the chlorine levels of your pool are high enough to kill bacteria and keep your pool clean without being so high as to potentially harm your pet. Both chlorine levels and the pH balance of the water must be properly regulated in order to guarantee that it is safe for your pet. The ideal pH level of a pool is 7.4, meaning that the pool water is only slightly more basic than your typical drinking water. Lastly, it can be a good idea to make sure you have everything you need to keep your pet safe in case disaster strikes. While learning to swim, a life vest can be a great tool to ensure that your dog or cat is safe while learning to swim. The vest can also increase their level of comfort while in the water. A first aid kit and other safety precautions are also highly recommended. Some pets take to water more quickly than others and it's important that you let each pet move at their own pace. Pets that fear the water should be introduced to it gradually. The best way to do this is to hold your pet and slowly enter the water yourself. Pets that still fear entering the water can benefit from facing away from the pool as you enter it. It is also important that your pet trusts you and that you have a firm, comfortable hold on the animal. With cats in particular, it's important to hold him against your body and out of the water- even after you've moved away from the pool wall. For particularly anxious pets, a comforting stroking motion and a calming treat before the lesson can help relieve the tension. Before submerging your pet, gradually go underwater yourself to the extent that it is possible to do so while still keeping your pet dry. After resurfacing, gently return to your initial position to comfort your pet. Now, even the most reluctant pet should be comfortable around the water, though it's important that you continue to hold him. Having the trust of your pet is essential for the next step; so until it is clear that your pet is completely comfortable, simply hold him in the water until he becomes calm; this may take several days of repeating the previous steps. Once your pet seems relaxed enough to proceed, place his legs in the water with a grip just loose enough for him to start a swimming a motion. Any initial attempt at staying afloat from small animals will likely be subpar- so before you let your pet move freely through the water, wait until his legs and paws are extended such that their motion appears adequate to keep them afloat. Once he has the paddling motion down, try moving him through the water to get him comfortable with paddling to change directions. At this point, release your pet into the water to swim freely while ensuring that he doesn't get too far from you. On the other hand, if he attempts to swim back towards you, it can be useful to back up as he approaches while maintaining a distance at which you could easily grab him should his head submerge. Once your pet is swimming like a pro- it's still essential that to watch him closely when he uses the pool. Additionally, it's important to teach your pet some simple safety measures. For both anxious and avid swimmers, it's imperative to teach your pet how to exit your pool. 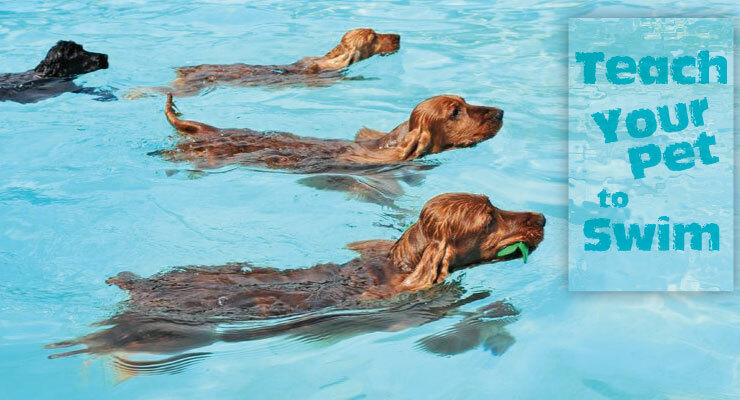 A dog may be a decent swimmer- but even the best swimmers can't swim forever. It can also be useful to brush up on other safety tips regarding the pets and pool, including how to perform CPR on your pet should the need arise. We hope this guide will have your pet swimming in no time- let us know how it works and if we left out any useful information by leaving a comment below!